Six months ago today an angry man walked into Pulse, a queer nightclub in Orlando, and murdered 49 people. According to the FBI and his own family, during the weeks and months leading up to the attack, he had become more noticeably outraged every time he saw gay men in public together. He plotted the crime carefully. He set up fake profiles on gay hook-up apps and used conversations there to find out which night clubs would have the biggest crowd. It was a carefully crafted anti-queer hate crime. 49 Pulse victims remembered in Orlando 6 months after massacre. A moment of silence at 2:02 a.m., the exact time the gunman started shooting inside the gay nightclub. I’ve written before about why this particular crime hits so hard for queer people in general, and me in particular. I’ve also written about why we shouldn’t ignore the hate crime aspect of this act of terror, and why the people who do so are perpetuating and enabling the hate that caused it. I’ve also written about why it is unacceptable to argue there is nothing that we can do about this kind of crime: They used to insist that drunk driving couldn’t be reduced, either. All of those things are still true. And with hate crimes on the rise since November 8, even more heart wrenching. 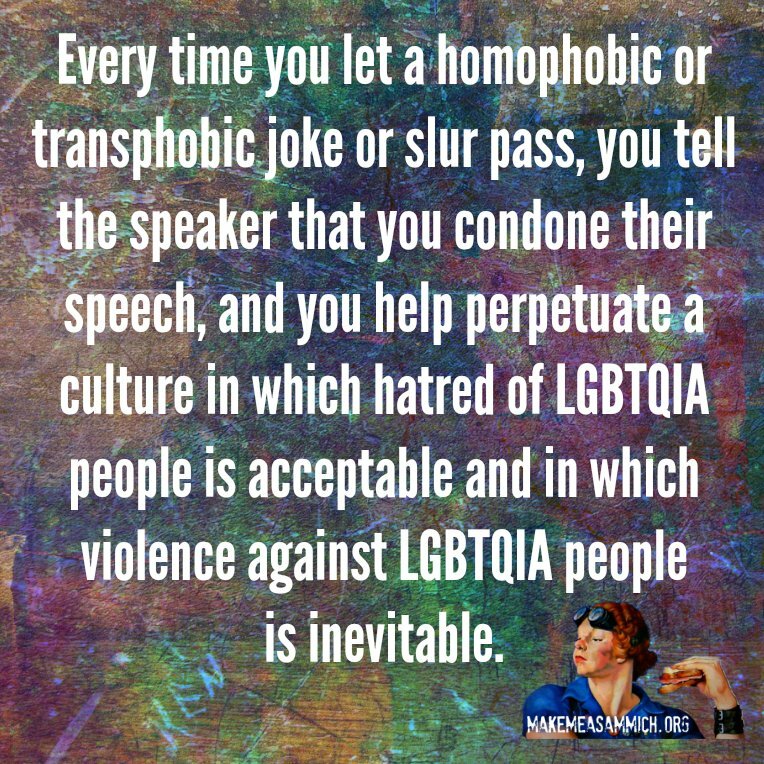 Please take to heart the words in the graphic I included at the top of this post: “Every time you let a homophobic or transphobic joke or slur pass, you tell the speaker that you condone their speech, and you help perpetuate a culture in which hatred of LGBTQIA people is acceptable and in which violence against LGBTQIA people is inevitable.” That’s not an exaggeration. If our very existence is nothing more than a joke, that implies our lives and deaths don’t matter. Those attacks and dismissals perpetuate the lie that we deserve pain and suffering. They perpetuate the lie that we shouldn’t exist. They perpetuate the lie that our love isn’t real. And all of those lies add up to one message that some angry people are all too ready to take to heart: that beating us, shooting us, and killing us isn’t really a crime.